Home > Shop By Brand > 303 Products > 303 Aerospace Protectant > 303 Aerospace Protectant 16 oz. 303 Aerospace Protectant Wipes303 Aerospace Protectant 10 oz.303 Aerospace Protectant 32 oz.303 Aerospace Protectant 128 oz. Bought this to restore exterior plastic trim on Honda CRV. Used the 303 Cleaner prior and it did a good job but not much different than any other all purpose cleaner. 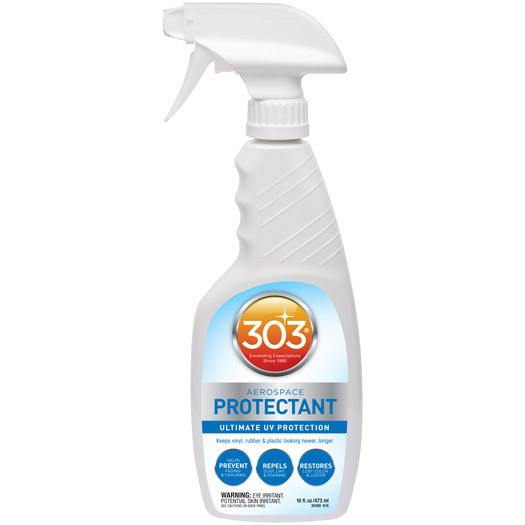 The 303 Protectant, however, is in a different league. Very easy to apply (on clean surface) and covers evenly. I like the low gloss finish. Product finishes very smooth and gives a like new finish to the trim. Here's the difference in 303 that I've seen so far. I'm 3 weeks in to the 1st application and the trim still looks good and hasn't faded back completely gray again! Tried several other products and they looked good until a rain storm or washing, then the trim went back to faded. This 303 seems to be restoring the natural black look of the trim. All 303 products are pretty solid but this is a leader in its category. It has so many uses: leather, plastic trim, headlights and many other uses inside and out. Been using it for years with no end in site. I use this as a tire dressing. Leaves a nice clean satin finish that is not greasy, does not sling off, and lastâ€™s several weeks till the next washing. I spray it on and let it sit for several minutes then just dab any access. If any gets on your wheels it is easily buffed off. I have also used it on rubber and plastic trim and it works very well. Pros Nice satin dry looking finish not a wet greasy look. This works really well on exterior trim, engine bays and tires. I like that it doesn't leave a greasy finish; just a very slight sheen that leaves tires/trim looking new. If you are looking for a leather protector for your car leather, this product has worked very well for me. This product works on other surfaces in vehicle interiors as well. You will have to check the product description to see them all or contact the manufacturer. This works better than Armor All and it does not leave a greasy residue. ProsThis works better than Armor All and it does not leave a greasy residue.